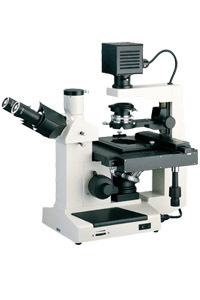 XDS-2 Inverted microscope is equipped with wide field eyepieces, long working distance plan achromatic objectives and very long working distance condenser and phase contrast unit. It can be observed transparent and unfinished living specimen in culture bottle or culture utensil. It is the ideal instrument suitable for research of living specimen structure, liquid, deposits and so on. It also can be used in research institutes, universities, medical treatment, agriculture and animal husbandry, etc.